Belgium Tourism stamp is a stamp by François Schuiten in a series on Belgium Tourism. The series has 5 stamps and was issued 4th of July 1992. The one made by François Schuiten is displaying the Great Procession in Doornik (Tournai). 1992 was the 900th celebration of this Procession. This year's anniversary of Tournai format celebrate the nine hundredth anniversary of the Grand Procession. First designed in 1092 by Bishop Radbod as thanks to the Virgin Mary for the salvation of the city, which was ravaged by the plague. The Procession is one of the main street events that many spectators a view of the rich artistic heritage of the ancient city on the Schelde: silver, gold, wood polychrome statues and reliquaries, masterpieces of the goldsmith's art as the shrines of Our Lady woman (1205), St Eleuthère (1247) and the Jonkers (1571) and the priceless Byzantine cross: the jewel of the treasure of the famous cathedral with its five steeples. 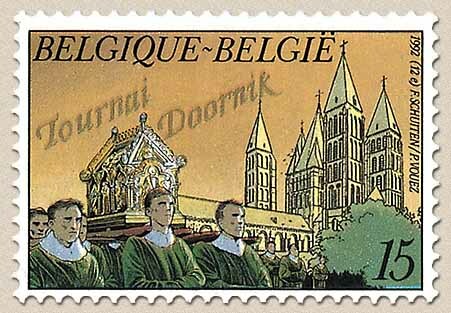 In this commemorative year, the Great Procession (13 september 1992) embellished with various groups from the diocese of Tournai and the neighboring dioceses. Numerous events (lectures, concerts, exhibitions and ballet) follow each other from April to October 1998.